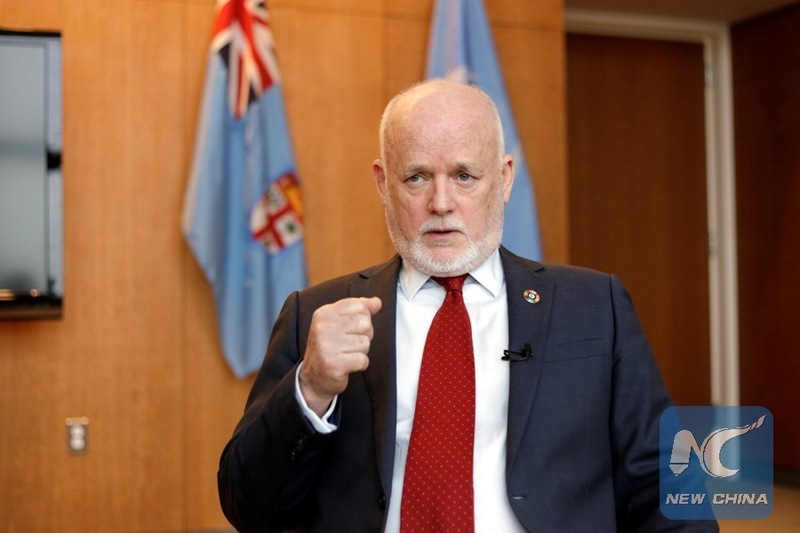 UNITED NATIONS, Jan. 29 (Xinhua) -- "Building a community of common destiny for mankind to me is the only future for humanity on this planet," United Nations (UN) General Assembly President Peter Thomson told Xinhua in a recent interview. Thomson said he met with Chinese President Xi Jinping in Geneva earlier this month, during which he heard of China's huge commitment to the United Nations, to multilateralism, and to globalization. During his four-day visit to Switzerland, Xi delivered a keynote speech at the Palace of Nations in Geneva on Jan. 18, expounding the concept of building a community of shared future for mankind, which is the core of China's foreign policy in the new era. Following Xi's speech, Thomson and UN Secretary-General Antonio Guterres both pledged that the United Nations will join China in promoting world peace and development, and in realizing the goal of building a community of shared future for mankind. Thomson said that we only have one Earth, so mankind must build a system based on rules, and advance forward in a civilized way. He said that cooperation between the United Nations and China will stay on course to help implement the Sustainable Development Agenda as well as the Paris climate deal to ensure quality of life for all people. As for sustaining peace, China, a permanent member of the UN Security Council and one of the biggest peacekeeping contributors, has a big role to play on the road ahead. Asked about China's initiative on trade and investment, like the Belt and Road Initiative and Asian Infrastructure Investment Bank (AIIB), Thomson said he applauds anything that will stimulate trade and investment, in this case, in the Asia-Pacific region. "There is a good neighborliness inherent in that policy, which is mutually beneficial to all the countries involved," he added. The Belt and Road Initiative, proposed by China in 2013, aims to build a trade and infrastructure network connecting Asia with Europe and Africa along the ancient Silk Road trade routes. It has won support from over 100 countries and international organizations. The AIIB was formally established in Beijing in December 2015 and started operation in January 2016. So far, it has welcomed 57 signatory countries and approved loans of 1.73 billion U.S. dollars to support nine infrastructure projects in seven countries. The UN General Assembly just held a high-level discussion about a new approach to form synergy between sustaining peace and the world's sustainable development. Sustaining peace and sustainable development are different sides of the same coin that are mutually reinforcing, Thomson said. "You can't have peace without development; you can't have development without peace ... that is no longer a debate," he said. With a new UN secretary-general, the world body will face various reforms this year which Thomson called a "change for the better." Born in 1948 in the Fijian capital of Suva, Thomson previously served as Fiji's Permanent Representative to the United Nations since February 2010, and acted as the president of the 71st UN General Assembly since September 2016.